I never call myself a food blogger. No, really. I have never felt that I can keep up with all of the prolific food writers and recipe developers out there. How some people manage to publish new complicated recipes ever single week is beyond me. It’s impressive, inspiring and quite honestly, a little scary. Plus we all know what taking too many photos of your food can do to you… But this year I’ve gotten a good taste of what it means to make food your profession. 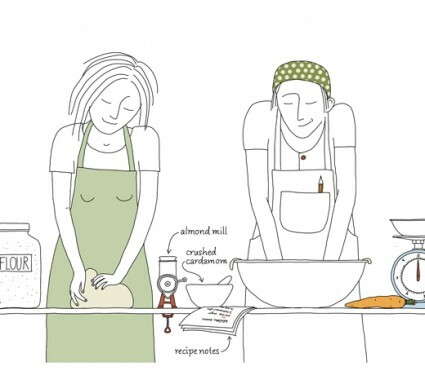 Along with Johanna Kindvall, I am working on an illustrated cookbook, with stories and recipes inspired by our Swedish roots, to be published by Ten Speed Press in fall of 2014. The entire thing is certainly an ongoing process, from proposal to contract to the many moments of “I have how many recipes to finish this week? ?” but it’s entertaining to be working on a book project. All to say, that if you think Foodie Underground has been a little quiet as of late, you can blame it on the fact that I am probably in the kitchen wondering how the hell I managed to go through yet another box of dozen eggs in only two days. First world foodie problems, I know. But it’s a project that Johanna and I are both very excited about, and we could only keep it under wraps for so long. That being said, don’t think we’re going to give anything away… you will just have to wait in anticipation until the book is finished to find out more! But please think of me in the kitchen, and if you feel the need to send over some craft roasted coffee beans to help the process, feel free. Meanwhile, we’ve also been putting the finishing touches on Culinary Cyclist: A Cookbook and Companion for the Good Life, which you will be hearing more about soon. Woo! So excited for this. Recipe: Gluten-Free Apple and Date Buckwheat Scones | je vais où?